Easiest way to learn and play guitar! 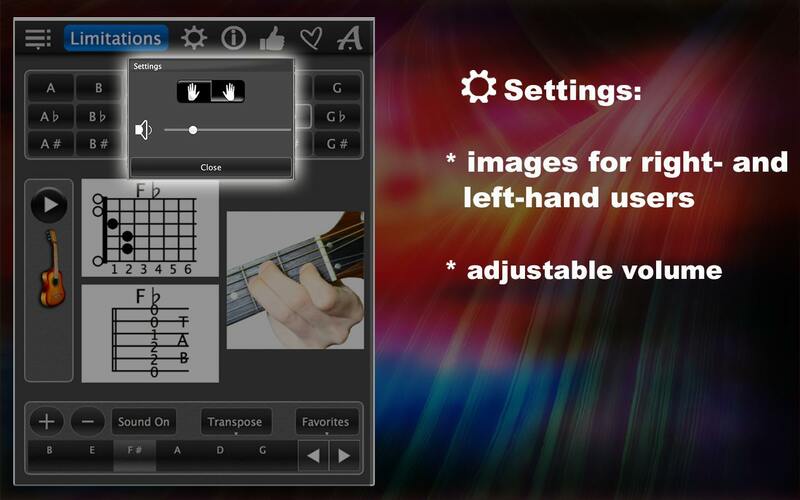 Guitar Chords Lite is a guitar app that offers you guitar frets, chord charts and guitar notes, for beginners or advanced guitar players. You may use its major guitar chords to play the easiest guitar songs or create your own guitar note chart or charts for your guitar practice sessions. 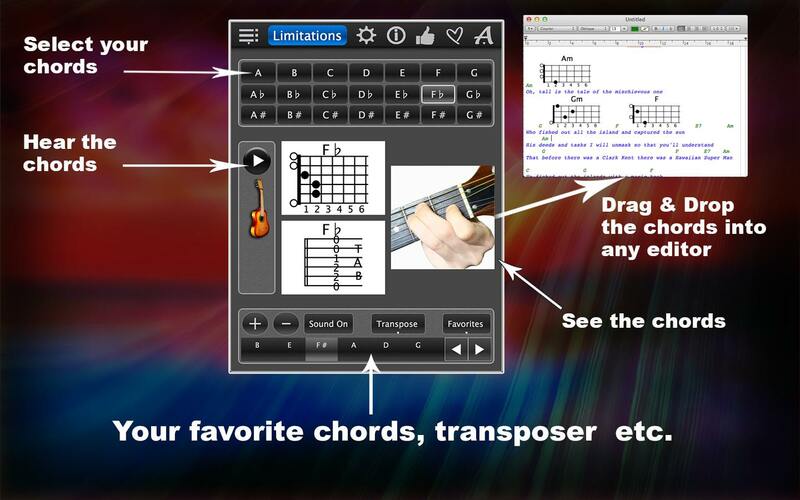 Guitar Chords Lite offers you one of the easiest ways to learn to play guitar. Its user-friendly interface with retina support is designed with both right-handed and left-handed guitar players in mind. Let the app know your preference in Settings. Now, select your chord! Once you have selected the key and the chord type, the app will show you your chord as guitar frets, guitar notes, and as guitar pictures with finger positions on a guitar fretboard. Now, listen to your chord with an authentic acoustic guitar sound. Experiment with different chords, use them for your guitar practice or your own easy guitar lessons! Create your own guitar chord sequences! Use these chord sequences to accompany your favorite guitar songs or your own compositions! Save them in your documents using Drag & Drop or in the app as Favorites. 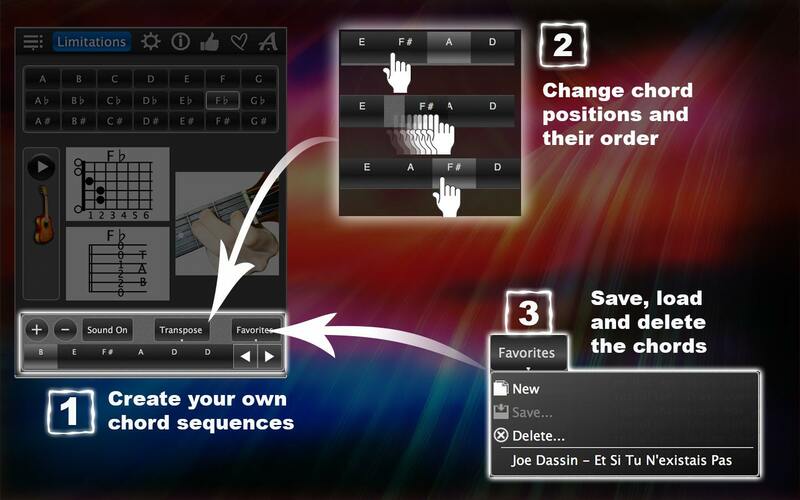 Save as many chord sequences as you like! Delete the ones you don’t need! 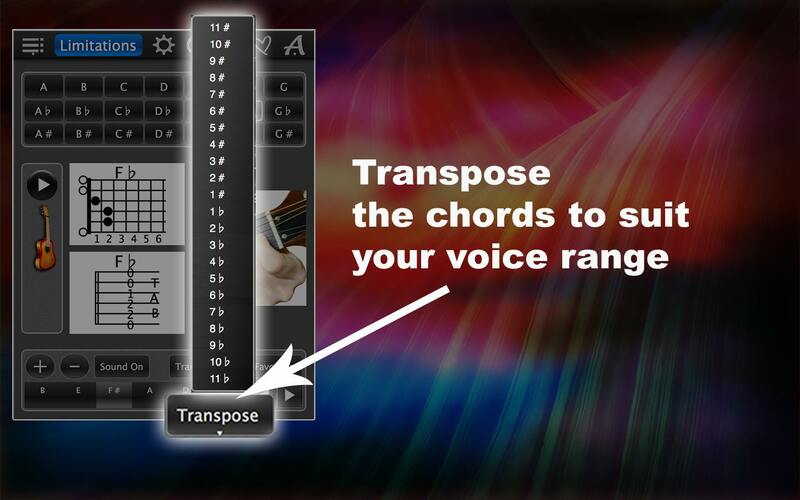 If you want to change the order of the chords within a chord sequence or transpose your guitar chord sequence up or down to accommodate your singing voice, Guitar Chords Lite will help you accomplish that as well! If you need all chords, upgrade to the full version “120GuitarChords“. Have fun with this guitar app! Download Guitar Chords now!